For the past few years, I have been aware that the theory side of the hairdressing industry has been somwhat neglected. The scientific information is mostly produced by the technical product companies to suit their needs. Other information is often written in such a way as the reader would require a dictionary to understand the content. Mostly, the books available to students are somewhat overwhelming because they are extremely wordy and attempt to cover too much information in one place. 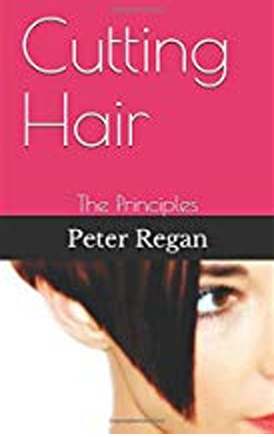 With this in mind, I am producing a series of hairdressing theory books covering a number of subjects using easy to understand language, short paragraphs and chapters, dealing with only one topic per book. The reader is able to choose which subject they want when they want to study. Available on Amazon, the first three books are complete and the fourth is currently being written and will be available soon. By printing to order, the cost of the books can be kept to an absolute minimum. 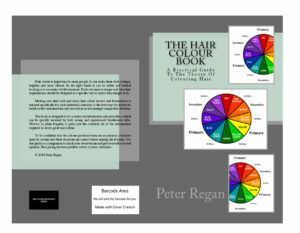 Book one, The Hair Colour Book is a practical guide to the theory of colouring hair. Click the image to view full size. 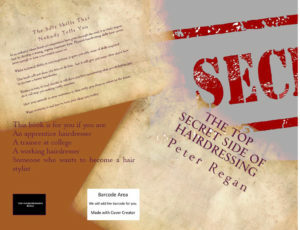 Book two, The Top Secret Side Of Hairdressing tells all of the things that hairdressers need to know but nobody teaches. Click the image to view full size. 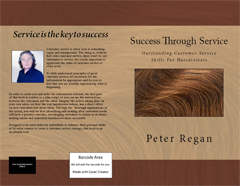 Success Through Service is a straightforward guide to customer service skills specifically designed for hairdressers. Delivered in the form of a film script, the reader can easily imagine the action happening in their own salon workplace. It is valuable for personal development as well as a great training aid for salon owners who want to improve the customer service skills of staff. Each scene is fully explained firstly by the story’s main character then by the book in more detail. This has the effect of reinforcing the messages contained in the text. Using easy to understand language, the reader can comfortably absorb and remember the various pieces of information, leading to increased knowledge and improved skills. Click the image to view full size. Cutting Hair – The Principles is a book designed for young hairdressers just starting to learn to cut hair. It deals with how to approach the cut and the customer, the tools used by professional hairdressers, why we cut hair wet, how to correctly position the customer and the techniques that I use to perform the seven standard haircuts that all other cuts are developed from. Cutting Hair – The Precise Way is for hairdressers with a knowledge of cutting but want to be better and develop their cutting techniques.Subjects covered include; Attitude, Technique, Elasticity and Cutting Hair, Visualisation, Matching the Cut with the Customer and Cutting Curly Hair.